We Will Beat Any Price Anywhere on the Same Merchandise! Cure or Cause of a Headache? 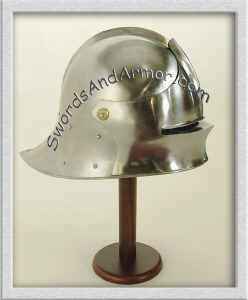 Medieval helmets came in a variety of shapes, styles and materials and share the same purpose as more modern ones-prevent the owner from a serious head blow that could maim or kill. That did not always prevent the owner from receiving a glancing blow that would knock him silly but at least gave the owner a better chance of survival when under attack. However, most were heavy and hot and gave their owners neck cramps so when to wear this protective barrier against arrows and axes? Helmets date back far beyond medieval times, probably developed from early man’s use of animal skulls or coconut shells on top of their heads for protection and ferocious appearances. Well, maybe the animal skulls. Perhaps the coconut shells helped when monkeys threw coconuts or maybe they just made good sun hats. Around 3100 BC, tin was discovered to mix with copper to produce a heavier metal which we know as bronze. 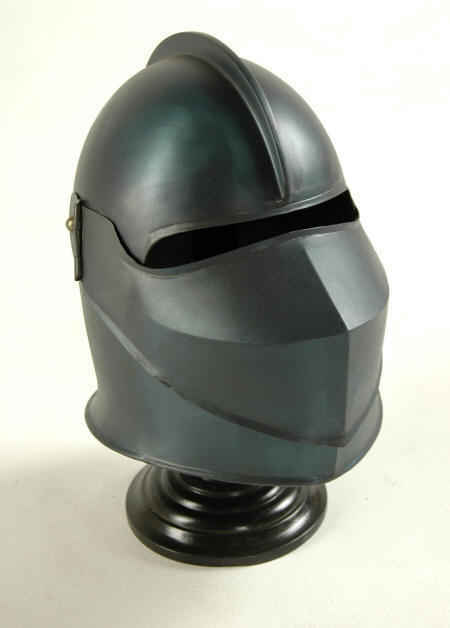 This made the copper harder and capable of better protection for the soldier who was facing heavy objects being aimed at him. Probably the first demand for the metal worker was “SWORD! 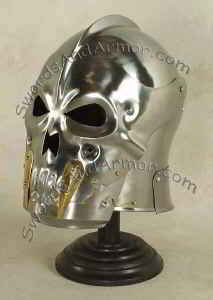 NOW!” followed by “HELMET!” This was acceptable to the happy metal worker who had found something new to play with, a substance that could hold a much sharper edge, was firm but still malleable enough to bend to his desire. 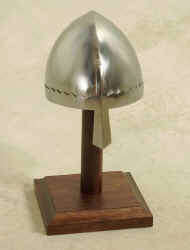 The oldest artifact of a helmet is found from Sumer around 2300 BC. The Sumer civilization was founded in Mesopotamia, which had no stone or metals and no timber which made it difficult to keep an army outfitted. These types of dilemmas gave great opportunity for trade routes to be established into Asia Minor and Syria and water routes would have been the safest and easiest way to transport these precious metals, stone and timber into the area. 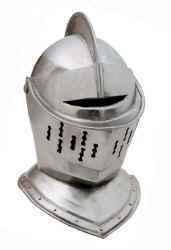 But let’s get back to our medieval helmets. 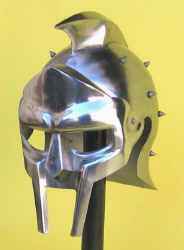 The earliest helmets of this time period were made from leather and favored by the Barbarians, the Horde and other non- Romans living in Europe. 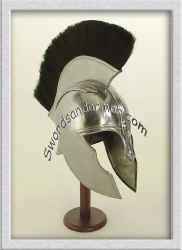 The Romans, having the glory of the Corinthian and Athenian ages in their corner came out with bronze and eventually steel helmets, with more style and complexity than their more simple neighbors before they disappeared in the 4th century. However, the styles in the early Middle Ages were a mixed lot with the juxtaposition of the Romans, with their history resting in the ancient dynasties and the more primitive and new kings of power, the Germanic tribes with their tribal clans of raw strength and passion. These styles were not representative of their respective cultures but a melting pot of both groups, just as the cultures themselves began to blend together. 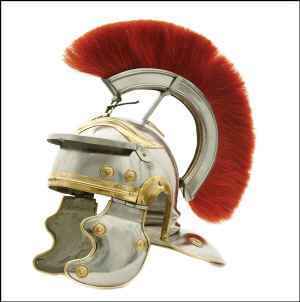 By the third century, the glorious head gears of the Romans had stopped being forged and were worn by whoever could get their hands on them. This was true of any helmet. Chaos ruled for several hundred years in those dark times with the withdrawal and dissolution of the Latin Roman Empire and the widespread territorial battles of the Germanic tribes that raged throughout the European continent. 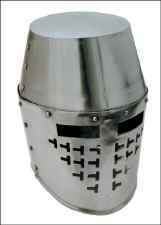 Any piece of armor, no matter the origin, became precious in a time that was difficult for survival from many causes. 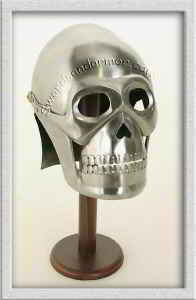 Armies, starvation and plague swept through these years and for most of that, no helmet could stop the blows. We Guarantee the Best Price and Quality ! 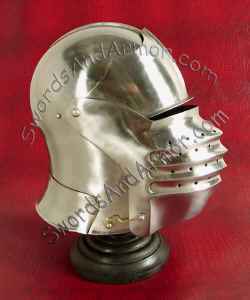 Copyright © 2001-2015 swordsandarmor.com . All Rights Reserved.